Grilled shrimp is a great building block to use to make larger dishes. Here, ten ways to use fresh or leftover grilled shrimp. Instead of stir-frying shrimp, add already grilled shrimp to the finished noodle dish before serving. Toss grilled shrimp with soba, Japan’s buckwheat noodles, and a garlicky, spicy sauce that’s both warming and energizing. For an easy, creamy pasta dish, toss fettuccine with mascarpone, spinach and grilled shrimp; the mascarpone melts to form a sauce. Add grilled shrimp to fried rice during the last minute of cooking. Instead of stewing shrimp with sausage, you can just add grilled shrimp in at the end. Toss grilled shrimp with kamut, an heirloom variety of wheat, green beans and tarragon—or any combination of grains, vegetables and herbs—for an easy salad. Toss grilled shrimp with black-eyed peas, arugula, cherry tomatoes and an herby dressing. 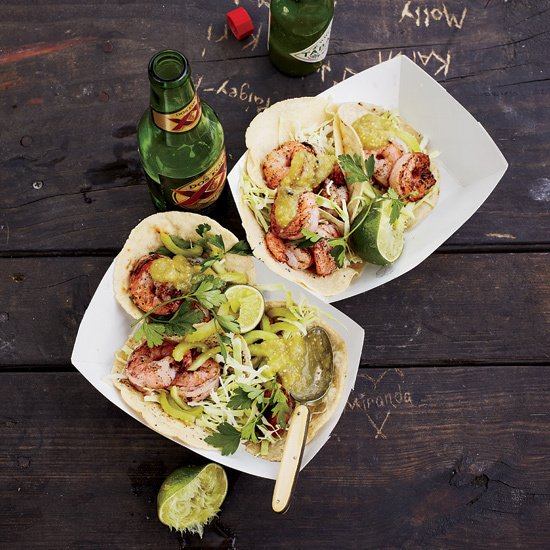 Fold shrimp in tortillas with tomatillo salsa and a lime-dressed sliced celery salad for a refreshing take on tacos. Sandwich grilled shrimp with lettuce, tomato and avocado on a Kaiser roll for a Mexican-style sandwich. For a Vietnamese-style starter, wrap grilled shrimp in rice paper with cellophane noodles, herbs and carrots, and serve with a sweet and pungent dipping sauce.